The first sugar cane crop of 2010 is drawing to an end. Rose Hall and Uitvlugt Estates have already completed the first crop. Albion, Blairmont, Enmore, LBI and Wales are due to complete within one to two weeks, while Skeldon would go up to the first week of May. Average rainfall across the industry continues to be extremely low and evaporation losses from the large surfaces of our extensive canal networks are enormous. We continue to suffer from soil moisture deficit, particularly on the East Demerara Estates. Prediction from the International Research Institute for Climate and Society of the Earth Institute, Columbia University, USA, is that for the period April-May-June 2010, there is a 50% probability of occurrence of ‘El Nino’ weather conditions. 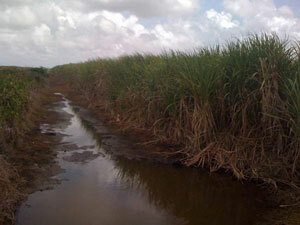 Cane growth and development has been affected at Blairmont, Enmore, LBI and Uitvlugt. This is more pronounced in the saline low-lying front lands at Rose Hall and Enmore. The Demerara Estates have had to cut back on their re-planting programme. The industry has had to confine irrigation to plant canes for germination and to plant canes two to seven months old, which are in their boom growing period. The least affected estates to date are Skeldon and to a lesser extent Wales, both of these locations were experiencing some sporadic showers, especially Skeldon. However, the National Drainage and Irrigation Authority (NDIA) continues to pump water into the East and West Demerara Conservancies to maintain supplies for agricultural purposes and domestic use. Supply to East Demerara has been improved by taking in water by gravity through the sluice gate at Maduni during high tides experienced last week. Similarly, the supply at West Demerara has been improved by building a stop-off and pumping at Two Mouth into the Service Canal. The East Berbice Estates continue to receive adequate supplies of water for factory operations, cane transport and irrigation from the Canje Creek. Blairmont is still obtaining water by pumping from the MMA main canal. East Demerara Estates are struggling to maintain their navigation canals for flotation of punts by pumping from the East Demerara Conservancy. Wales Estate continues to obtain a reliable supply of fresh water from the Kamuni creek via pumping. All the Estates are re-circulating water. 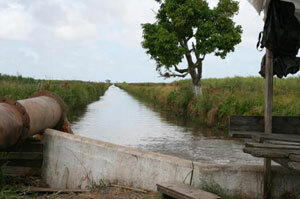 With the crop over at Uitvlugt Estate, available water is currently being channeled into areas where cane is being planted. Mobile pumps released from NDIA are still in operation to supply water to Enmore, LBI and Wales. Skeldon Estate had also released one mobile pump to Blairmont and one to LBI which are also utilised for water supply. The integrated agricultural strategy developed and the water management measures adopted by the industry have so far been successful in mitigating some of the adverse effects of the ‘El Nino’ weather conditions. Water management Strategies implemented includes the following: optimum water conservation practices; recirculation/re-cycling of water, monitoring of water availability and quality at source; monitoring of soil moisture; close monitoring of the operation of water control structures; appropriate harvesting sequence; and appropriate crop husbandry practices. Water conservation practices include recirculation of water from the drainage system into navigation canals for cane transport and irrigation. Sluice gates are locked and secured to prevent intrusion of salt water. Daily water quality monitoring is done in areas where pumps are used for water supply and recirculation of water. The operation of the gates on the Torani canal are closely monitored to ensure that adequate amounts of water are released to augment the supply of fresh water down the Canje Creek for the East Berbice Region. Check sluices and stop-offs are used to control water levels and water quality within the canal networks for irrigation and transport of cane punts. Canes are harvested in sectionalised blocks to optimise and conserve on the use of water. 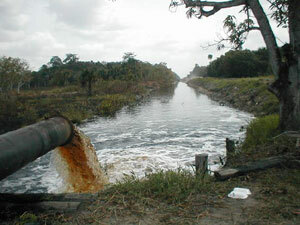 Water from canals within harvested blocks are released and pumped out into canals within blocks, which are to be subsequently harvested. By careful planning and development of an integrated agricultural strategy which includes stringent water conservation measures, and by making efficient use of available water resources, the sugar industry has succeeded in planting substantial quantities of new cane despite the prolonged agricultural drought. Since the weather can be volatile and so as not to be caught off-guard, the industry is already making preparations for the anticipated May-June rains.